If you drive a taller vehicle, such as a pickup truck or an SUV, the risk of car accidents in which your vehicle rolls over is a major concern. A recent rollover accident in Bradenton which left one person dead and another with serious injuries calls attention to the problem. The following outlines how these types of crashes occur and steps you can take to help prevent them. A Bradenton car accident claimed the life of a local man and left the passenger in his vehicle suffering serious injuries after the Ford F-150 truck he was driving veered off the road and hit a culvert. According to reports in the Bradenton Herald, the crash occurred on Monday, December 10, 2018. A 32-year-old man was the driver of the truck and was headed south on 15th Street East near Helen Road in Bradenton. For reasons that are still unknown, the truck swerved out of its lane and off the road, slamming into a culvert. The impact caused the truck to flip over and eventually land on the right side, in a ditch along the road. Traffic officials report that the man died as the result of the crash while an unnamed passenger in the vehicle is being treated at Blake Medical Center for serious injuries. According to Consumer Reports, a vehicle rollover is one of the worst things that can happen to drivers and their passengers. While they tend to be a factor in less than five percent of all crashes and collisions, rollover crashes are responsible for roughly 30 percent of all motor vehicle deaths each year. They are most common in taller vehicles which sit higher off the road, such as commercial trucks, pickups, vans, and SUVs. 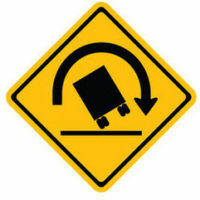 The higher center of gravity in these vehicles makes them susceptible to rollovers when rounding sharp curves, taking turns at a high rate of speed, or when striking objects and other vehicles. Watch your speed: High rates of speed are a contributing factor in roughly 40 percent of rollover accidents. Check tire pressure: Poorly inflated tires and uneven pressure can increase the odds of a rollover. Carry even loads: If driving a pickup, van, or commercial truck, make sure loads are evenly distributed. Wear seat belts: In the event of a rollover, seat belts can prevent you from being thrown from the vehicle. At the Law Office of Steven G. Lavely, we provide trusted legal guidance when serious car accidents impact you and your loved ones. To discuss how we can help you, contact our Bradenton car accident attorney and request a consultation today.